Brian started HPC with his wife Karen in 1983 and has filled his time with exploring every corner of the Adirondacks since then. Owner of High Peaks Cyclery, Brian has been guiding for over 30 years. He's the senior winter guide and Program Director. Guiding rock & ice climbing, hiking, backcountry skiing, telemark and winter mountain ascents. and in summer he specializes in big hikes, road and mnt bike coaching clinics, and bike fits. He promotes many fun and competitive events. He is the fearless leader and enthusiast extraordinaire for the HighPeaks/ Lake Placid & Adirondacks regions. Let him share his knowledge, staff , gear and enthusiasm with you ! Karen has been exploring the Adirondacks since she moved here in 1980. Whether paddling, hiking, or skiing, she loves sharing her passion for the outdoors with everyone. Karen moved to Lake Placid January of 1980 to work as a nurse during the 1980 Olympics games. She fell in love with the area and all it has to offer and started HPC in May of 1983 with her husband Brian. Four children later she still loves to get out in the great local wilderness, especially sharing her passion with women, children, and families. Her specialties are nordic and back country skiing and snowshoeing, biking (all types), hiking and paddling. She is even a life guard and teaches local kids and triathletes swimming. She welcomes all to experience the Adirondacks diversity and beauty! Specialties: Hiking, backpacking, kayaking and canoeing, snowshoeing, cross-country skiing, biking and water safety. Royce has been a guide since the 70’s. He has traveled all over the world in his adventures and is eager to share his love and knowledge of the outdoors with you! Royce started his guiding career in the early 70’s leading wilderness canoe trips in the Boundary Waters of Minnesota and the Quetico, Canadian National Park. He added rock climbing to his resume in the early 1990’s. Royce’s climbing sojourns have taken him to California, Colorado, Kentucky, New Hampshire, Oregon, West Virginia and the Dolomite’s of Northern Italy. Royce was born out West but has lived in or near the Adirondacks for the past 40 years. He is employed as a seasonal full-time alpine ski coach and wilderness guide. Ace guide/cliff climber extradonaire Colin Loher has been guiding in the Adirondacks 20 years. In those 20 years Colin has organized, and led adventures, expeditions, workshops, and accredited college courses to some truly amazing places such as the Adirondacks, Mexico, Spain, and many points out west and the southeast. Colin is an active member of numerous, local, volunteer, backcountry and high angle rescue teams in the Adirondacks. Colin graduated from Northland College in 1995 with a double major in biology and outdoor education. Since then he has been fortunate enough to be able to practice the fine arts of this trade. Whether it be guiding a new climber up their first multi-pitch rock or ice climb; teaching someone how to lead climb, directing numerous outdoor programs; writing curriculum, articles, and technical manuals; working in outdoor retail/marketing, etc. Colin has immersed himself in pursuit of delivering first in class outdoor experiences for all populations. One of Colin’s favorite aspects of being an outdoor educator is helping people to make positive connections to the environment, themselves, and others around them. Much of his commitment to the field of outdoor education stems from his passionate belief that being in nature and engaging in outdoor environments creates launching pads for renewed thinking that infuses energy into our lives in enduring ways. Certs: NYS Rock and Ice guide since 1998, AMGA Single Pitch Instructor, NOLS risk management for managers, WOLFER- Wilderness Medical Associates, NSP level I and II avalanche. Alexander (Zander) Connor is native to the Adirondacks, and continues to grow his affinity for this unique mountainous region of the world. Zander started with HPC in 2014 after freshman year at college. Paired with four years and a bachelor's degree in SUNY Plattsburgh's Expeditionary Studies, his passion for the outdoors has developed towards larger pursuits. His travels have taken him climbing in the Himalayas, backcountry skiing in Kyrgyzstan and Finland, and circumnavigating the Scottish Highlands by sea kayak. Zander has been coaching mountain biking since he started, as well as assisting in all other categories of guiding. Since earning his NYS Guides License early in the summer of ‘17, he is excited to share his technical expertise, as well as continue to grow with the HPC guide team. Specializations: Alpine Touring, Telemark, Backcountry Skiing, Sea Kayaking, Canoeing, Whitewater Kayaking, Mountain Biking, Backpacking/Hiking/Scrambling, Expedition Planning. Jeremiah has been coming to the Adirondacks since he was a kid, growing up just a couple hours west in Watertown, NY. He earned a Bachelor’s Degree in Recreation, Adventure Travel, & Ecotourism from Paul Smith’s College. He also spent a summer as a Backcountry Steward in the Eastern High Peaks region of the Adirondacks. Since then Jeremiah has spent his time further exploring the Adirondacks; including ice climbing, rock climbing, paddling, and backpacking. His certifications include Wilderness First Aid, CPR, NY Search and Rescue Volunteer, as well as Wild Land Fire Fighter training. Jeff's ski tracks can be traced all over the Adirondacks. If you want to get into the backcountry, then Jeff's your man! Jeff loves giving his clients an extraordinary experience in backcountry skiing, XC skiing, telemark, hiking, backpacking, snowshoeing, canoeing, kayaking, and camping. His certifications include Professional Ski Instructors of America, National Ski Patrol, Wilderness First Responder, Outdoor Emergency Care, CPR for the professional rescuer, and life guarding. He also works as a volunteer ski patroller at Mt. Van Hoevenberg. Originally from just north of New York City, Devin has slowly migrated north towards the Adirondacks, now residing in Canton, New York where he works as the Assistant Director of the St. Lawrence University Outdoor Program. Devin has climbed all over the United States and Europe and love's sharing his passion for climbing, and creating friendships through shared experiences in the natural world. He regularly runs multi-day climbing courses across the country whether it be in the Adirondacks, Joshua National Park, CA, Red Rock Canyon, NV, the New River Gorge in West Virginia or somewhere new. He loves taking people out for their first climb, introducing people to the joys of multi-ptich climbing and empowering folks to become self sufficient climbers through student centered instruction. Devin has been a certified AMGA Single Pitch Instructor for nearly 10 years and is a Provider of the AMGA Climbing Wall Instructor certification. He is a certified NYS rock guide & Wilderness First Responder. Joe is a 22 year old fly fishing guide who has been taking clients out for the past 3 years. Joe is a seasoned sportsman, a true professional, and his passion for any fishing endeavor is contagious. Joe knows where the coveted local spots are and has many of his his own "secret stashes " that he is more than happy to share should you book him for an outing. Almost as old as the Wooley Mamoth, Pat is living legend in the Adirondacks. His passion, energy, and professionalism are unrivaled. You would be hard pressed to find anyone better to go on a climbing or ski adventure with. Pat has worked around the world as professional race ski coach for the last 25 years . When Pat is not coaching, he most liklely be found looking for new rock faces to climb. Pat's list of first rock ascents is quite impressive. Pat, quite litterally, has put up many of our regions best climbs. 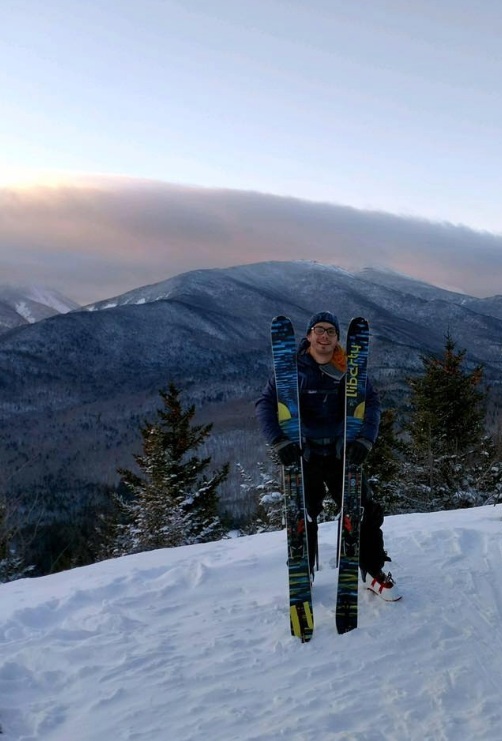 A true local, born and raised in Lake Placid, Jay Rand has hiked all 46 peaks and loves to share his passion and knowledge about the Adirondacks. Our clients are always happy to spend the day with Jay. Jay is soft spoken, unassuming and easy to like. Jay is a lifelong ski jumper who is currently the executive director of local NYSEF jumping program. Prior to that Jay was on the US national A ski jumping team including the 1968 Olympic team. Jay was the first person ever to jump the 90 meter. For many years, Jay also was the manager of Whiteface Mountain which was no small under taking.